As a brand-new addition to the Mazda line-up, the SUV offers refined quality in all the areas that matter to drivers. It features the maturing Kodo design language and Mazda's new-generation Skyactiv-Vehicle Architecture, which draws out people's inherent balance ability. The powertrain line-up comprises the latest Skyactiv engines, including the revolutionary Skyactiv-X, which adopts a unique combustion method to combine the free-revving performance of a gasoline engine with the superior response of a diesel. 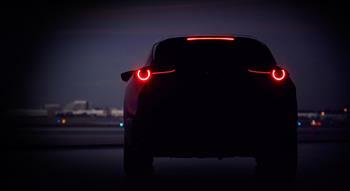 Geneva will also host the European premiere of the Mazda MX-5 30th Anniversary Edition, which will be revealed for the first time at the Chicago Auto Show in February. (1) Press days are March 5-6. Public days are March 7-17. Mazda will hold a press conference at 1:00 p.m. on Tuesday, March 5 (local time). A teaser, as the second new-generation model breaks cover.